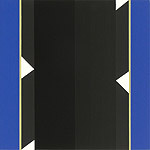 In his new work there is a strong feeling of containment, as many of the colored bands are situated left and right as opposed to top and bottom. This format enhances a feeling of compression in the compositions. In some, matte black border bands have been added, creating an all-around framework. 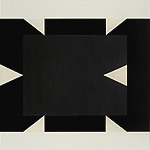 The central black fields occasionally overlap the black borders, appearing to step outside the framework of the composition. In the new work, the colored bands have become more vivid and intense in palette, and there is a distinct shift away from muted tones. 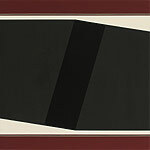 The twisting and crossing black geometric fields of the earlier work have been abandoned in favor of a greater irregularity in the newer paintings, but the tension between angled edges and the underlying sense of movement remain. Some of the black fields are playfully suggestive: swinging doors and walking figures spring to mind. The artist employs a diptych format in several paintings, creating rhythms back and forth, like a paired dance. In some, symmetry is retained even though the forms don’t mirror one another exactly. Throughout, with a deceptively reductive abstract vocabulary, Voisine mines the manifold possibilities of his format and creates taut, muscular, and elegant compositions with rich surface textures and complex inner tensions.